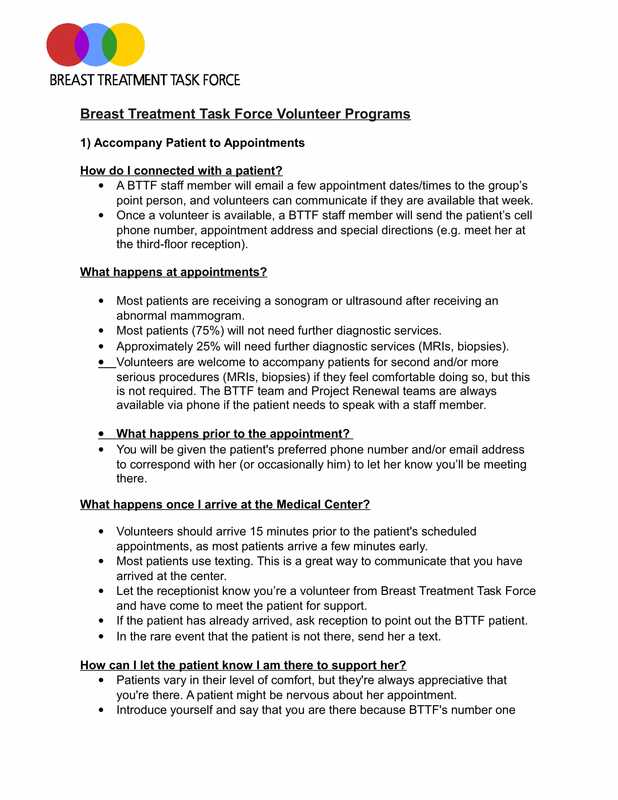 Breast Treatment Task Force (BTTF) is looking for volunteers to assist with its Patient Companion Volunteer Program by accompanying new BTTF patients to their mammogram and sonogram appointments. Most importantly, helping them feel at ease. Volunteers help ensure that all BTTF patients feel supported and well cared for throughout the diagnostic process. For more details, please download the Patient Accompaniment overview by clicking here. If you have any questions or would like to volunteer, please send an email to contact@the-bttf.org. In addition, please complete and the following BTTF Patient Accompaniment Volunteer Form below. If you are a breast cancer or pre-breast cancer patient, or the family member of a patient with a passion for helping patients without health insurance, we invite you to become a BTTF Patient Ambassador. As a BTTF Patient Ambassador you can make a significant difference in the lives of breast cancer patients by advocating on their behalf. Patient Ambassadors provide their insights to the BTTF team as we evaluate our programs, as well as to patients who may need help with resources or healthcare provider issues that affect them. The BTTF team will assist Patient Ambassadors by providing resources including training, materials, and talking points.